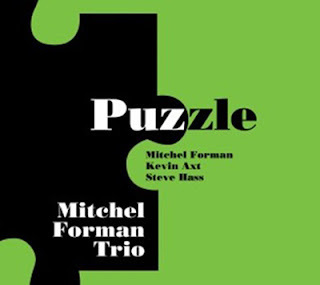 Only longtime jazz fans are likely to know who Mitchel Forman is; I do, because he was the pianist who performed with Gerry Mulligan — in both his big band and the quartet — and, later, with Stan Getz. Those were all great, great units. Forman assembled the first of his own groups in 1985, and he continues to produce his own albums. This release — which features Kevin Axt on bass, and Steve Hass on drums — is his newest effort. The operative terms that apply to Forman are swinging, straight-ahead jazz; blazing keyboard speed; precision and tastefulness. Both members of his rhythm section fit in beautifully. Axt, who accompanied Tierney Sutton for years, is one of the best bassists working; Hass is a vocalist’s dream, supporting and never intruding. The menu includes a dozen tunes: Some are new, but the oldies really stand out. The trio’s interpretation of “What Is This Thing Called Love” is sensational; complimentary melodic lines and meter changes put a wonderful shine on this great standard. “Bounce,” using the chord changes of “I Got Rhythm,” is done at a race-horse tempo that’ll blow your hair back. Frankly, every track demonstrates this trio’s talent and cohesiveness. This definitely is not background jazz, and you won’t be able to take your ears off it. Please ... more, more, more! Numerous vocalists have become actresses, but I can’t think of many performers who took that trip in reverse. Sarah Partridge is one of those rare examples, and she enjoyed modest success for a decade on TV and the big screen, including an appearance in Risky Business with Tom Cruise. Then fate stepped in: While spending an evening with friends at The Improv, they talked her into participating in a karaoke contest. An agent in the audience was enthralled, and signed her up; thus began her musical career. As often is the case, her love of vocal jazz had begun at home; her father was a huge fan of icons such as Ella Fitzgerald, Chris Conner, Irene Kral and Sarah Vaughan. Fortunately, Partridge has a voice that matches their talents, and that led to her success in what has become a 20-year career. 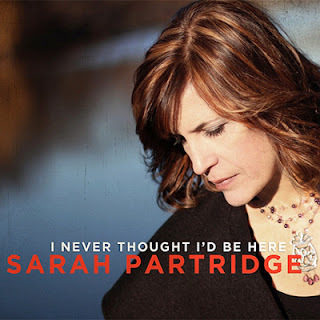 Partridge is featured regularly at many well-known jazz clubs across the country, and this is her fourth album. She has a wonderfully relaxed voice, which is great for both popular standards and jazz genre tunes. Although her first three releases focused on the American Songbook, she switched gears and wrote (words and music) all but one of the tracks here. The exception — “Around the Corner” — is by Alan Farnham, this album’s pianist, arranger and producer. This is a great album for listening or dancing. And if Partridge shows up at a lounge in your area, be sure to visit her.